For Open Sew, bring what tools and materials needed to work on your own projects. Skill Building is offered for the advanced beginner quilter who is comfortable with machine stitching and needs to improve some of the skills listed below. ‘Free motion quilting for the artistically challenged’ will also be discussed, but not practiced in class. You can choose the skill you want to work on or work on all the techniques listed below. Only a straight stitch machine is needed for this class. 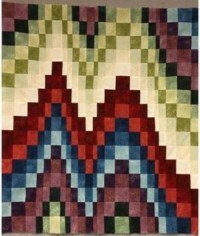 Combo Unit – Half square triangle with two quarter triangles (3 fabrics). Continuing from last February, in Hand Embroidery, we will visit basics for complete beginners as well as more advanced skills for people with some experience. Use the knowledge and skills from this class for your own art work, to enhance shirt or dress collars, cuffs and pockets. And/or learn stitching for embroidery on crazy quilts. Luann will bring books and sample to class for you to enrich your experience. teachers if you are interested. 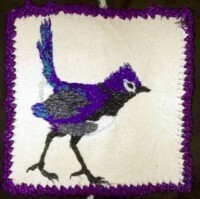 -Fabric to embroider on sizes of 6” X 6”, or 8” X 10”, or other sizes that you would like to use in class. 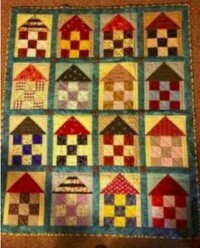 If you have a finished block that needs embellishment this can be the perfect way. -A garment you may want to embroider, collar, pockets, cuffs etc. 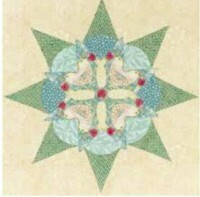 English Paper Piecing (EPP) will be used to produce a mini quilt using either the Brimfield Block or the Brimfield Star pattern. The focus will be on sewing curves using EPP and on fussy cutting fabric to get special effects. We will also cover the basics of EPP for anyone who is new to this great classic technique which dates back to at least the 18th century. There will be individual instruction for anyone who is just starting. We will also explore some of the many possible ways this technique can be used and spend some time discussing finishing and quilting these designs. acrylic templates, please bring them. If you don’t have them, I will be ordering the paper pieces only, when we get closer to Super Saturday and you can pay me for them when you come to class (so we can save on shipping) or you can order them directly from www.paperpieces.com if you’d like. If you do want me to order them for you, please add that information on your registration form, indicating whether you are ordering the Brimfield Block or the Brimfield Star. The cost will depend on how many are ordered but will be less than $10 per block. For those who don’t have the acrylic templates, I will be bringing mine to class for people to use. The templates are convenient but not necessary. You can trace around the paper shapes with a pencil and cut out the shapes with a scissor after adding the 3/8 inch seam allowances. Thread Painting will consist of a small thread painted piece that can be completed in one day. See samples below. Choose the image you want to work on before class and let Linda know your choice. Fair-good sewing machine skills, using the open toe free-motion foot, are required. There is plenty of time until February of 2019 to sharpen your free-motion sewing skills for this class. -Two packets of universal needles, size that you are comfortable working with. -Regular sewing supplies such as scissors, pins, ruler, threads, etc. Check with Linda for more specific information. 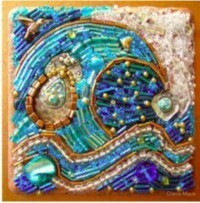 Using beads on quilts, combining embroidery with beading, wall hangings and wearable art can enhance and define your design. The beading can be the focal point of the design, or simply add the finishing touches to your work. This class will continue from last year using more advanced technique as well as basics for new students. Beading thread –Nymo or Silamide, or a fine polyester thread would work for a sample piece. A neutral color such as tan or grey is fine, I use Nymo. needles through your beads to see if they fit! Bead mat – something to keep the beads from rolling around – a piece of velour blanket, a wash cloth, piece of felt, or plastic lids 4”-6” in diameter will all work. 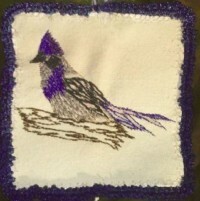 Project – Something to put the beads on – an embroidered piece, old or new: an almost completed piece (beads are usually the finishing touch), a small quilt block sandwiched with batting to practice on, a garment to embellish-collar, pocket, cuffs etc. unfinished. This quilt is an excellent opportunity to use small pieces in your stash, start a lively quilt for a child or for Comfort Quilts, or create a runner, a cushion cover, whatever. You can also sharpen cutting and sewing skills while enjoying the company of fellow quilters without pressure (and there’s cookies!). Your fabrics of choice, as many colors as you decide to use. 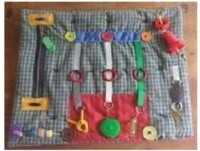 Sewing supplies such as scissors, pins, needles, cutting mat, rotary cutter, ruler, and tape measure. Sewing machine with all necessary feet and attachments. 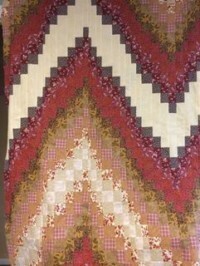 Come learn how you can make an interesting Bargello quilt with a jelly roll. After sewing 14-16 strips 2 1/2” wide together, we will be cutting the strip pieces into different widths to make this wonderful quilt that seems to have movement. There’s a trick to pressing the seams so when sewing the strip pieces together the seams will nest together. Lots of fun seeing your quilt come together. This class takes clothesline bowls to the next level. 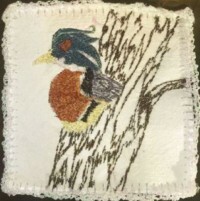 After learning the basic technique and experimenting with threads and stitches,different materials will be used as well as embellishing with unusual materials. The kit fee is $25 per student and includes materials to make multiple bowls in varying sizes, colors and materials. The clothesline will be hand dyed and available in many colors. Other cords will be supplied and available in many colors. Embellishing choices are also included. Students need a machine that will sew a zigzag stitch, lots of bobbins with various colors of thread, variegated threads in various weights and colors and solid thread in many different colors. Fidgit Quilts have sixteen(16) 6” squares sewn into four rows with light to medium weight batting and backings of flannel or corduroy as donations. These will be constructed sandwich-style, using half-inch seams, then turned like a pillow cover. “Quilting” will be in the ditch and then the quilt will be top-stitched all around the edge to create the finished effect without binding. Complete instructions will be provided with each kit. Suggestions for donations: please bring to December and January meetings.